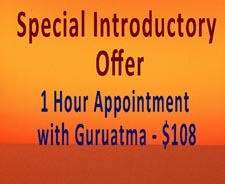 “I highly recommend Guruatma’s yoga experiences to everyone, especially those experiencing health issues. I first met Guruatma many years ago when she was a participant in the Metropolitan Multi-Service Center Aquatic Program. At the time she was experiencing many health issues herself and was using the water to help improve her strength and mobility. She spent many, many hours of concentration and hard work in the water. “For a couple of months, I have measured and recorded my blood pressure twice a day to see if there is a pattern. From these measurements I have noticed that it takes about 24 hours for the numbers to change significantly. The results for the last couple of days are 132/83 then 140/83 and this morning 146/89. Then, I came to chair yoga, where we exercised and then you played the gong for us (which I loved). I stopped at the grocery store and then came home. I thought I would take my blood pressure again just to see if it was going up or down. Surprise, surprise. At 1:00pm today my blood pressure was 125/79. Amazing! Thank you for all that you do. Love always.” Pat L.
“I am currently a graduate student and am studying to become an occupational therapist. 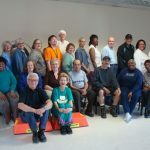 I attended the Chair Yoga Class at the Adaptive Recreational Center as part of a school project and was moved by Guruatma’s story. The fact that she was once in the position of several of her students and took advantage of the aquatic classes and yoga classes at the center for her own recovery provides her student’s with hope, motivation, and the inspiration to be active participants of their own recovery. 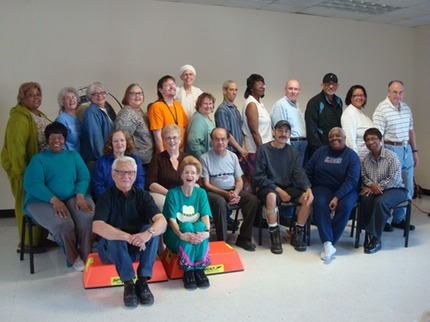 “I was in the hospital for ten days, and what I learned in chair yoga was very helpful to me. Thank you very much.” Beatrice G.
“It’s like a shot in the arm; it really is! It’s like a dose of medicine.” Desiree B. “Yoga has helped my tight muscles. I don’t feel tightness and I can sleep better.” Mary Ann S.
“Class rocked today! Yes, what an awesome class! I found myself so very present in each moment during yoga class. With Guruatma’s guidance, self example, and passionate energy, my mind did not wander to self critique nor other ego driven distractions. Passionate enthusiasm is shared and, enthusiasm is said to signify God within. 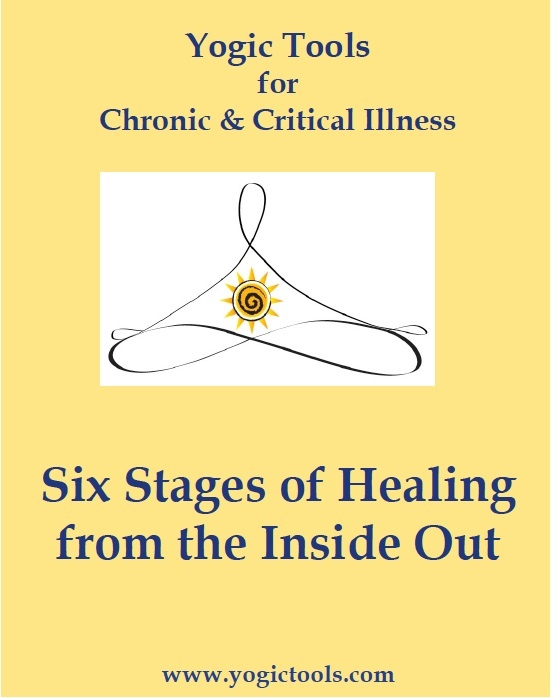 Pain has been the primary distraction in my life, as of late, resulting in such physical limitations. I have not shopped in a store in well over a year or more, because of the pain walking results in. So today, I was gifted a newly reclaimed ability beyond all of the limitations that have become my daily existence since the accident. Today I WALKED with my grandchildren through a lovely stretch of the park – a significant amount of walking and there was little pain. I took it slow, yes. But truly, I was ABLE, and ABLE to accept whatever presented itself, whether limited or expanded. “I am an Enrolled Agent and this past tax season was one of the most grueling I have yet to experience. I embraced it. I interacted with so many types of personalties, most of which were stressed, anxious and many, unpleasant. It was my goal from the outset of the season that no matter what, I would serve each and every individual with accuracy, efficiency AND as if I were the person sitting on the other side of the desk. The fundamentals of Kundalini yoga that I have learned in Chair Yoga class helped me to enjoy a record-breaking and most profitable tax season. SAT NAAM” Desiree B. “When I first came to yoga, I did not know what to expect. My conditions include heart issues, diabetes, blood pressure and kidney issues. After awhile, I find that the things that help me most are Spinal Flex, hands together at the heart center and, the most important is the breathing. I find that I use the Yogic Breathing several times during the day, to great advantage. Chair Yoga is wonderful for those of us how are challenged in some way or other.” Gerald C.
“You asked us a question in class. You said, ‘Check in with, listen to your body – what is it saying to you?’ My body was saying, ‘Thank you for coming! !” Sand H.
“It’s a different kind of energy; it’s a good energy.” Ana C.
“I had a stroke in 1992. I tried all kinds of therapy but my strength only recovered partially. I tried to get lessons in yoga that I could do with my limitations, but the yoga school explained to me that they could not help me because it was strenuous exercises. When I started yoga with Guruatma, I found I could do yoga with my limitations.” Harish S.
“Recently, I had a CT scan, and while lying there I began to feel anxious. But, I could hear you saying “keep up, Beatrice” and I was able to compose my self and finish the procedure. Thanks for all your help!! Sat Nam.” Beatrice G.
“Yoga class lowered my blood pressure and, because of the exercise with tightening and squeezing the muscles (root lock), I do not get up during the night to go to the restroom. The class is very relaxing.” Barbara C.
“I like the philosophy of yoga. I hold my breath a lot and yoga helps me remain conscious of my breath. The breathing exercises and stretching in the chair are excellent.” Debbie P.
“When Guruatma explains an aspect of yoga, it makes me wish I had never missed one of her classes.” Tom H.
“Ya know what I like about it most? It helps me integrate my body and mind, and remember that they are one. I think in America, we think that the mind is some kind of special thing in a jar and we forget that the brain is the control center of the whole body, whether we are aware of it or not. And yoga makes us conscious of that. So many of us develop behaviors when we were small children and, those strategies are still controlling us.” DaVee A. “I am an above-the-knee amputee. The classes have expanded and improved the way I breathe. This is very important since learning to walk unassisted requires a tremendous amount of energy. The exercises, specifically meditation, help increase focus and concentration. I am able to direct energy forces to whatever part of the body requires attention. I cannot wait until Fridays for class. I hate to miss class because I know I am missing an application in my quest to go to the next level. Spiritually, the peace I feel within helps me to be more understanding and loving as a human being.” Desiree B. “Since attending class, the numbness in my fingers and hands has subsided, tremendously. When I went for my physical, my blood pressure was good. In the past, I would get up 2-3 times during the night. Now, I sleep undisturbed the entire night.” Magdalena T.
“My balance has improved when I sit and walk.” Carl M.
“Class feels good!” Kevin M.
“This method is stimulating to the muscles. Yoga and breathing deeper has helped my health and shown me ways to control my body. My balance has improved.” Rose D.
“Yoga has given me better posture and helped my inside organs.” Renaldo F.
“My cardiologist is so happy I’m taking this yoga class. She said the breathing is great, and yoga gets rid of stress and tension that you don’t know you have. We all know stress and tension are not friends of the heart. Sometimes, I am so relaxed in class, I almost get too calm.” Wanda M.
“You help me to be calm, relax me, make me sleep sound, and concentrate better.” Albert R.
“With Guruatma’s instruction I was able to direct my own healing energy to my heart and arthritic hands.” Pat C.
“Guruatma treats each student as an individual and uses a positive approach to encourage and motivate. She is a caring and intuitive teacher who gently brings out the best in her students. Being a member of her class has been a special experience.” Bette L.
“The Yoga class is an enlightening experience and a powerful component in working toward optimum health. I always feel I have made a wonderful investment in myself. My yoga class is like feeding myself emotionally, physically, and spiritually.” Jan S.
“I feel good when I do KY : ))” Margaret H.
“The Breath and Breathing we do in yoga has cleared my lungs. I am now working on other body parts! From my world of curiosity to a world of healing, learning and doing. Knowledge and awareness are a divine blessing.” B. L.
“I felt so blessed to be a part of your class and to witness your powerful energy. I visited your website and was deeply touched by your journey; it gave me great hope that I can participate in reinventing my body to a wholeness that I have not know since I first practiced yoga, as you said, in the womb as a fetus. Well I am definitely in that fetal state at present. Thank you so much for this work you do. The center is a lovely facility and I plan to utilize it fully.” Janet M.